The smartphone arena in India, especially the affordable segment, is bursting at the seams with a plethora of options, spoiling the customers for choice. As compared to a few years ago, affordable phones these days are much more powerful and capable, with some of them even giving pricier devices a run for their money. And with an increased spending capacity and enticed by newer trends, users are now changing their smartphones much more frequently too. In this scenario, it would be interesting to see how user preferences are shifting, and figure out which brands have the most loyal user base. As part of the 91mobiles Consumer Insights Study, we surveyed over 15,000 smartphone users in India and asked them a bunch of questions online, and the results pertaining to the aspects mentioned above are highlighted here. We asked respondents about the smartphone brand they owned before they moved to their current device, and it looks clear that Samsung was the clear market leader earlier, with a 25 percent market share. The chaebol was followed by Xiaomi, with 20 percent share. This corroborates with findings from most industry reports published by various research agencies too, and we all know how Samsung ruled the roost before Xiaomi stole its thunder. 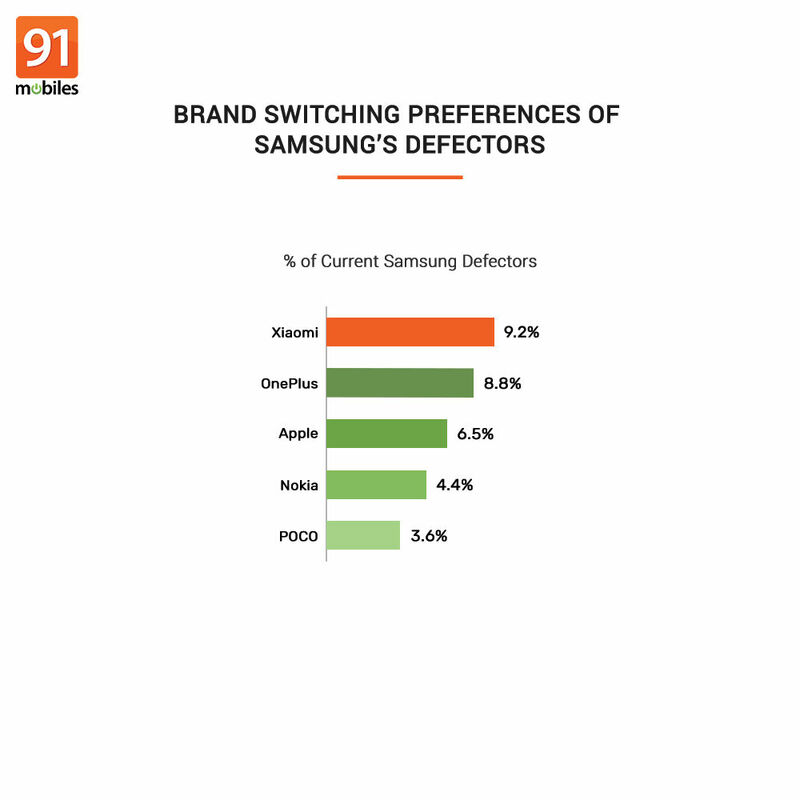 Responding to the query on the smartphone brands in use currently, almost 28 percent users said they own Xiaomi, and 19 percent use Samsung. This shows how the tables have turned, and how Xiaomi has managed to swing things its way, and that too within just 4 years of entering India. And while we’re on the topic of ownership patterns, it also makes sense to glance at our findings on how things might change in the time to come. The clear leader that emerges based on data on the smartphone brands users might migrate to in the future is Xiaomi again. 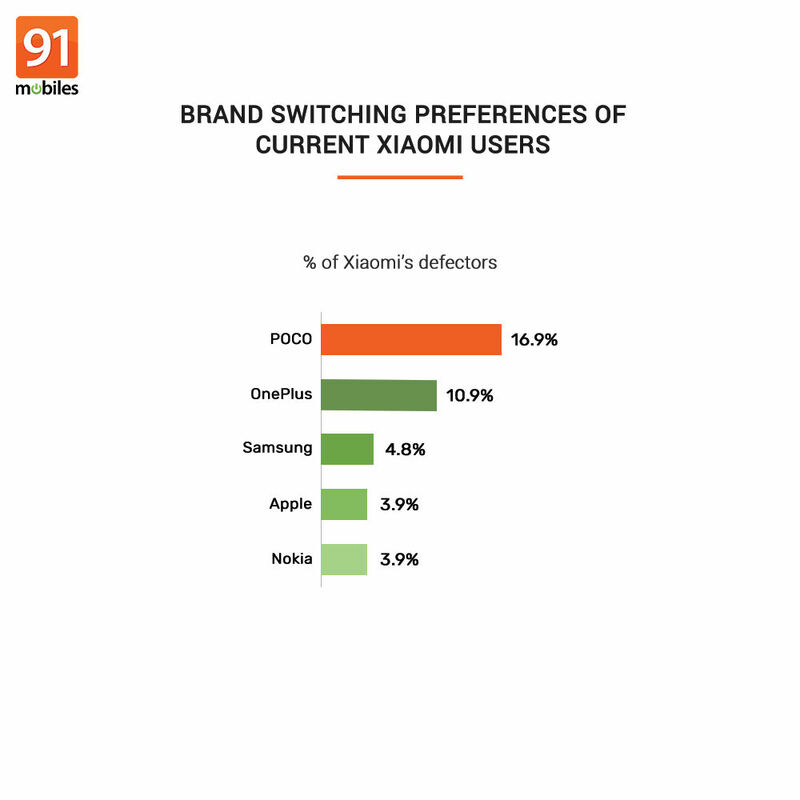 What’s interesting is the fact that almost 10 percent of the total number of respondents are considering moving to POCO, which, as you might be aware, is a sub-brand of Xiaomi and is definitely the one to look out for in 2019. It makes sense therefore, to add these numbers to those that pertain to the parent brand. After doing so, we can see that almost 28 percent respondents want to shift to Xiaomi and POCO. Judging by this, it’d be safe to say that Xiaomi’s move of launching a new sub-brand has paid off. And given that POCO only has one smartphone model to offer for now, things are likely to go further in its favour once it comes out with more options. Following Xiaomi is Samsung, with 16 percent respondents saying they might buy one of the offerings from the Korean major. In fact, we went ahead and collated the ownership patterns on a single slide, showing how brand preferences are shifting across time. The visual shows ownership patterns of smartphone brands from the past, current and future together, and throws up some very interesting points. For one, it’s clear Samsung’s user base is dwindling steadily over time. Next, Xiaomi has shown significant growth when the ownership patterns from the past and present are compared, and is likely to grow in the time to come as well, especially after we include the number of people of who want to buy a phone from its sub-brand POCO. Next, most brands are showing a decline when we look at the numbers from future ownership patterns, it’s interesting to see that Nokia and Apple could see significant growth in pure percentage terms (as compared to their current numbers) in the months to come. As far as Apple is concerned, we all know it’s an aspirational brand, and many people, even those that can’t afford it… dream about flaunting an iPhone. Apple’s move of launching multiple variants together might also have something to do with many people now wanting to buy a smartphone carrying the fruity logo. Not to mention that the recent lot of devices are all pretty compelling, and have received extremely positive reviews on all aspects, especially performance and camera capabilities. On the other hand, Nokia’s rising fortunes could possibly be attributed to its strong product strategy, with parent company HMD Global launching a slew of smartphones in the mid-range, and many of them looking quite compelling in terms of the capabilities and their pricing. The build quality of Nokia-branded smartphones is still top notch, and HMD Global has also been able to play on the nostalgia factor well. Honor and Huawei look more or less steady, but it’s OnePlus that’s showing a massive jump vis-a-vis its current numbers, with users of many other brands like Motorola, OPPO, Vivo, ASUS and LG planning to buy a OnePlus device in the future. Almost 9 percent of current Samsung smartphone owners want to shift to OnePlus, while the same number for Xiaomi users is 11 percent, for Honor and Vivo users, it’s 12 percent, Motorola a whopping 16 percent, OPPO 8.5 percent and Apple 9 percent. 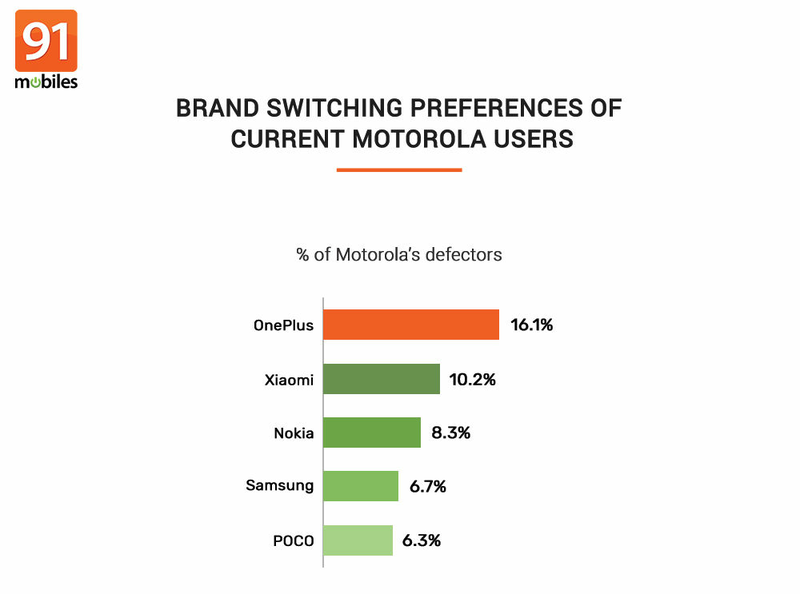 Looking at these numbers, it’s clear how OnePlus seems to be drawing users of other brands, resulting in a significant bump in its user base. The combination of flagship hardware, reasonable pricing, focus on community and issuing timely software updates could be the key reasons for this. 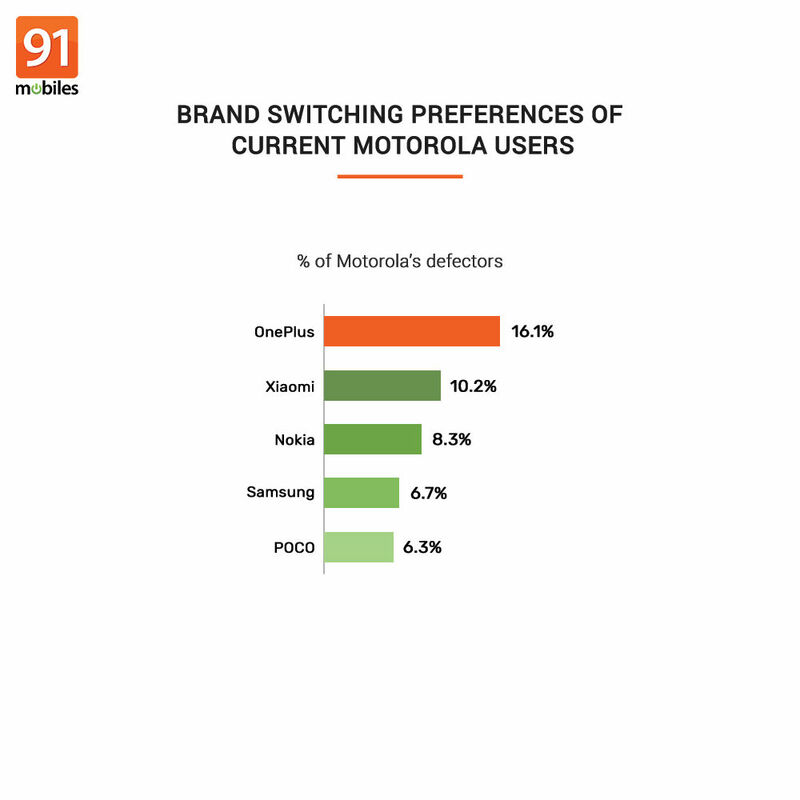 Overall, Lenovo and Motorola seem to be the two brands that could lose a big chunk of their users to other brands. Motorola’s dip could be attributed to the fact that it hasn’t been able to keep up with the competition, and in all the segments Motorola is present in, there exist other, more compelling options. While stock Android and the promise of timely platform updates was one of the key factors Motorola played on, the same features are now being offered by other brands too – Nokia and Xiaomi (with its Mi A1 and A2) for example. Lenovo’s loss of popularity could be due to the fact that it went missing in action from the Indian market, leading to loss of mindshare. And things may have taken a turn for the worse after accounting for the fact that many Lenovo users seem dissatisfied with their smartphones, largely due to service and usage-related issues. Here’s the entire study for your reference. At this time, it’d suffice to say that the great Indian smartphone bazaar is full of twists and turns, and poised to throw up quite a bit of interesting data next year as well. We’ll see how that plays out… watch this space for more such insights.